There is no better place in America than Boston to experience the richness of America’ journey from a diverse group of British colonies to independent nation. In this walkable city, significant and carefully preserved colonial-era sites are clustered were the city took root – downtown close to the harbor, and in the North End. It is through these sites that the story of America’s founding is told. Also in the North End, the first impression: it’s small. The second: it’s very old, evident in floors and stairs, footstep-worn since its construction in 1680. Best known as the home of patriot Paul Revere between 1770 and 1800, a house tour reveals small rooms with interesting furnishings and artifacts focusing on the Revere era as well as 17th and 18th century life in early urban Boston. From spring through fall, the entry courtyard comes alive with demonstrations of colonial crafts, cooking, silversmithing, displays of Revolutionary War surgical tools. This 2.5 mile red brick or red painted walking trail goes by 16 nationally significant historic museums, churches, meeting houses, parks, and burying grounds which together tell the story of colonial America, the American Revolution and the challenges faced by a fledgling nation. Clearly marked on Boston maps, the Freedom Trail can be a self-guided walk. However, doing it on one’s own is to miss the story of each site and how it relates to the American story. Walk it on a 90 minute Freedom Trail Tour led by knowledgeable, engaging 18th century costumed guides.The most popular tour, A Walk through History, highlights 11 of Boston’s 16 historic Freedom Trail sites. The North End Tour gives visitors the opportunity to explore the part of the Freedom Trail that winds through Boston’s oldest neighborhood to see additional sites. Note: Freedom Trail Tours go by the sites but do not go into them. While on the Boston tour, make a note of the museums and sites to explore later. Dwarfed in size by modern Boston’s downtown Financial District high rises, but definitely not diminished by them in beauty or stature, the Old State House stands out as a remarkable historical gem. Built in 1713, it is the oldest surviving building in Boston and America’s oldest and finest examples of British architecture. A lot happened here. 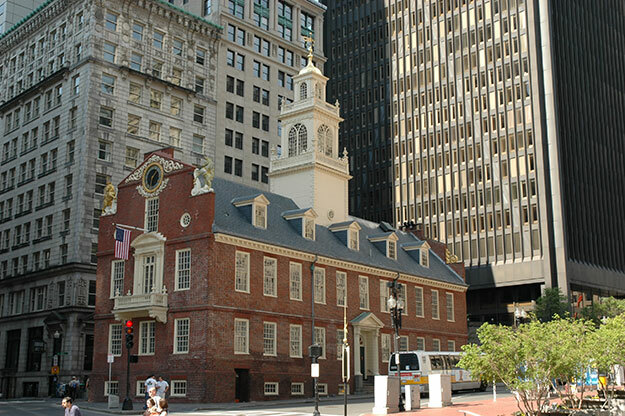 The Old State House was at the epicenter of Revolutionary Boston. In this building colonial politics and economic interests merged. It was here, in separate chambers, the Royal Government, the Massachusetts Assembly and the Supreme Judicial Court convened. Here too, was the location of the Merchant’s Exchange, the economic engine of colonial times. Open to the public as a museum of interesting spaces and artifacts, it has quite a history to tell. A large circle of cobblestones centered by a stone marked with a star and surrounded by an inscribed bronze ring is embedded in the center of the busy triangle in front of the Old State House. It marks the site of the Boston Massacre. Everyday downtown workers and visitors crisscrossing the busy triangle scurry over it without giving it a thought. However, its symbolism is profound. It was here, on March 5, 1770, that violence erupted between occupying British forces and local citizens. The impact was far-reaching. Just a few blocks from the Old State House a distinctive red brick building with a white spire commands a busy downtown corner, oddly juxtaposed with a huge modern glass-front store across the street. This is the Old South Meeting House, built in 1729 as a Puritan Meeting House, the largest building in colonial Boston. While it does not seem unusually big from the outside, it’s surprisingly large and starkly grand inside. Its role in the American story as a sanctuary of free speech is pivotal. Colonists gathered here to challenge British rule in the years leading up to the American Revolution, including protests of the Boston Massacre and the meeting that led to the Boston Tea Party. While limited artifacts and documents are on display around the perimeter of the hall, the interior space is awesome and what took place here is astounding. Imagine 5000 people jammed to the rafters on the night of the Boston Tea Party, loudly voicing their passionate sentiments. Bostonians love the Common. It’s a favorite place to stroll through, sun on the vast expanse of lawn, throw a Frisbee, listen to concerts, watch a Shakespeare performance. Initially set aside as community grazing land, it has always been a place of the people – a place of public Puritan punishment, a burying ground, a British encampment, a place of protests – from colonial to modern times. Beacon Hill rises on one side, the distinctive gold-domed State House rising on the hill at the corner of Park and Beacon. Park Street Church with the must see Granary Burying Ground behind it, anchors the corner at Park and Tremont. Lovely Boston Public Garden runs parallel to the other boundary. Grab a takeout lunch at one of the many eateries nearby, find a place on the lawn, and enjoy the Common. Up School Street from the Old South Meeting House, King’s Chapel, should not be overlooked. 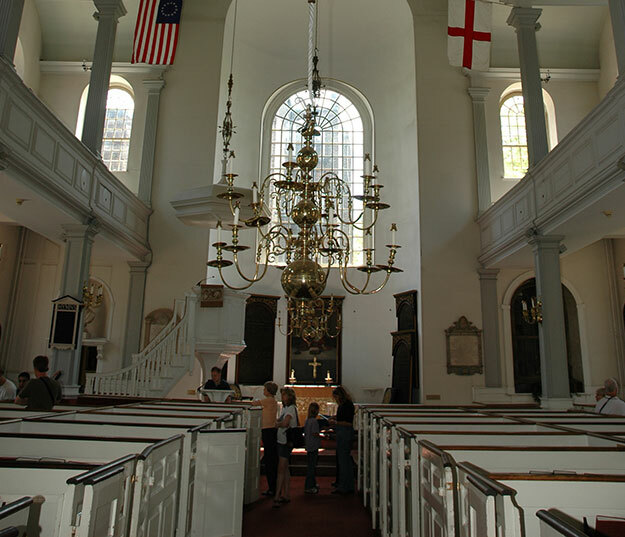 Established in 1686 as the first Anglican Church in New England, it was the official church of Loyalist Boston. In 1749, the present building was constructed around the original wood church, and remained an Anglican church through the Revolutionary War and until in 1785 when it became the first Unitarian Church in America whose congregation is active yet today. Open for public tours, this is a remarkable place with a history that mirrors the family loyalties,divisiveness and evolution integral to America colonial history. It has countless architectural elements to explore: the oldest pulpit still in use in America; a hidden stained glass window, evidence of its early Anglicanism; the royal pew; box pews of the ordinary and the legendary; a below-ground crypt, with some occupants visible through opening is brick walls, and ever so much more. Although located next to it, King’s Chapel Burying Ground was never a part of the church. It is a historical Puritan burying place, open to the public for self-guided tours, and is well worth the time. 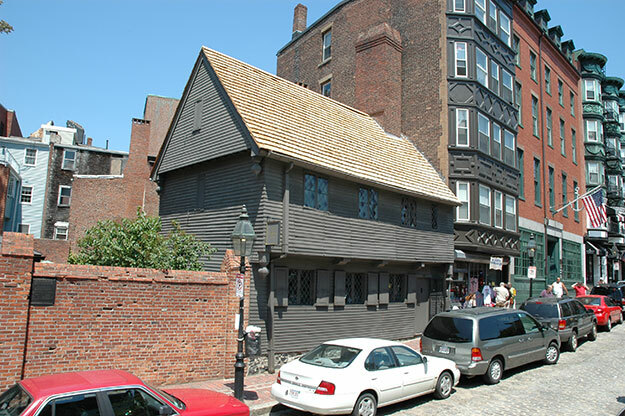 A visit to the North End, one of Boston’s oldest neighborhoods, and home to the Old North Church and the Revere House, is well worth a separate trip. It was in this neighborhood that many outspoken patriots lived, worked and frequented taverns to debate, convince and plan. Very old brick buildings housing first floor Italian restaurants, small shops and markets lean in on narrow curving cobblestone streets. High on a hill the stately white steeple of the Old North Church commands a distinctive vantage point. It was here two lanterns were hung on the fateful night of April 18, 1775, sending a signal which led to the event that ignited the American Revolution. Still an active Episcopal congregation, the storied church, constructed in Georgian style architecture of 1723, is open daily for visitors for guided tours. Stunning, intact historical architectural details are inside: a high, tiered pulpit with massive sounding board; box pews below, and bench seating in the galleries above; magnificent pipe organ; rescued angels with a story; a crypt below. While there, don’t miss the Printing office of Edes & Gill, and Captain Jackson’s Historic Chocolate Shop on the Old North Church campus. First launched on October 21, 1797, she is the oldest commissioned warship afloat in the world, ordered for construction by George Washington to protect fledgling country’s growing maritime interests. During the War of 1812, her defeat of four British warships became legendary, earning her the nickname “Old Ironsides.” Operated by the US Navy, her Navy crew is selected for this special duty, a responsibility and pride which is clearly evident in all they do. While normally open for public tours, Constitution is currently in dry dock for repairs and will not be available for tours until 2018. However, she can be seen in Dry Dock 1, adjacent to her berth in Charlestown Navy Yard. What a great opportunity to see what she looks like out of water, from top to bottom! It is a once in a lifetime experience as the last time she was hauled out was 20 years ago! Also in Charlestown, the Bunker Hill Monument stands in tribute to the ill-equipped,untrained American colonial army who, in defeat against powerful British forces in a battle on this site on June 17, 1775, turned the tide of war by repelling the barrage of British assaults and causing enormous casualties.